Lady Antebellum: Das ist der Name eines der erfolgreichsten amerikanischen Country Trios. Aus ihren bereits drei veröffentlichten Alben sind sechs Nummer 1 Hits hervorgegangen und auch hierzulande waren sie mit ihrem Song „Need You Now“ (2010) mehrere Wochen in den Charts vertreten. Das erfolgreiche Trio hat über 11 Millionen Tonträger verkauft und kann bereits sieben Grammys ihr Eigen nennen. Zudem haben allein im letzten Jahr mehr als 1 Million Zuschauer ihre Live Tournee besucht. Und der Sommer wird "Golden", denn Lady Antebellum präsentieren unter diesem Titel ihr neues Album, zu dem das Trio bei ihrer letzten US-Tour inspiriert wurde. Für Lady Antebellum ist "Golden" das nächste Kapitel, das den Sound der Band neu definiert und dabei noch packender und ansteckender klingt als die Vorgänger. 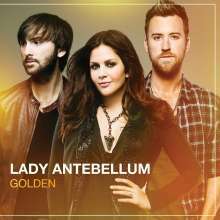 Produziert wurde "Golden" abermals von Lady Antebellum selbst und dem Producer-Veteran Paul Worley. Mit der Single „Downtown“ stürmen sie bereits die US Radio Country Charts und der Song ist bis dato der höchste Charteinstieg der Band. Damit zeigen Lady Antebellum in welche Richtung die Reise dieses Mal gehen wird. Sie klingen energiegeladener, verspielter und lässiger. The harmony-based trio and its sizeable fan base bonded heavily during the band’s headlining ‘Own the Night World Tour’, an over-sized road trip, if there ever was one. The shows themselves were inspirational, but so was the time offstage. Lady A made a point of experimenting and creating with its road band as the one-nighters and the miles of travel piled up. That behind-the-scenes interaction inspired much of the music on Golden, an instantly infectious project in which Lady A discovered new edges for its already-successful foundation. Lady Antebellum’s familiar, established blend remains firmly intact, but there’s a sense of renewal about it, too. Lady A and veteran producer Paul Worley return as co-producers on Golden, a reinvented version of Lady A that’s familiar but simultaneously unlike any of its predecessors. It’s an achievement that comes from the band’s journey, and from its willingness to risk. “Downtown”, Golden’s funky lead single, first announced the new direction in January. The band gave it an energetic, playful performance with a noticeably cleaner production than the previous album. The recording uses fewer instruments – each of them framed distinctly in the sound – and Scott delivers the lead vocal with a full-on attitude that’s never been completely realized in previous recordings. In some ways, GOLDEN also reaffirms the very beginnings of Lady Antebellum. The project focuses on deft song-writing and fresh uses of their talents, which was at the heart of what drew them together in the first place. In the end, the mix of their road experiences, song-writing and challenging outside songs adds brightness to the album that’s reflected in the GOLDEN title.